Some of you may know I’ve been looking for a mint NH F50R burst for a while now. Nothing much out there, until I came across a listing on Reverb about 10 days ago. This listing however wasn’t for a NH F50R… it was for a new Oxnard F55e burst! Actually, it was a Guild representative’s sample instrument used for less than 2 weeks. So the guitar was in “new” condition for all intents and purposes, came with a lifetime guarantee and I had 14 days to try it risk free. A no brainer I concluded… I have to take the plunge! The seller is a mom & pop store in Massachusetts doing business for over 43 years. Spoke to the owner, real nice guy, said he had a couple of Guild rep guitars and lucky for me, he had a new jumbo burst! The F55e burst has a street price of $3900. The seller was asking $3K and with a little haggling, I was able to pick it up for $2495 shipping included. Sources say the bracing in the F55 was based on the Orpheum series, which would be consistent with what Ren Ferguson said at winter NAMM 2015. How much, if any, of the Orpheum DNA made it to the F55 is hard to verify, but it’s clear from this video https://youtu.be/cCXKWgYzq4Q?t=122 that this was Ren’s intention up until he announced his retirement. After receiving the F55e, I let it acclimate to its new surroundings for the mandatory 24 hour period before opening the case. My excitement level was very high, and it was really hard not to take a peek. The case itself is probably the most beautiful, well made case I’ve ever seen. 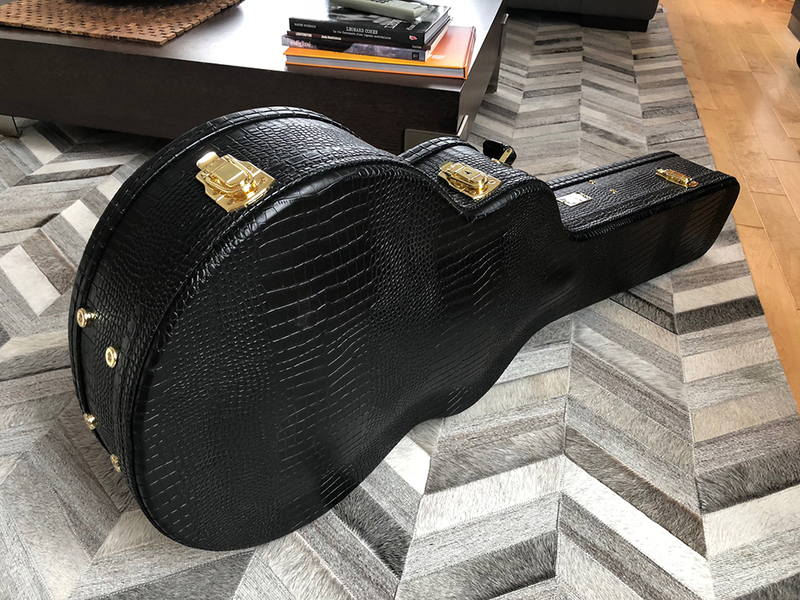 It’s made by Humicase and has the deluxe faux alligator styling that usually comes with the traditional series, however, the material used to cover the case feels like “real” leather vs the hard plastic feel of my NH D55 OHSC. It also has a nice quilted interior and an integrated humidification device which is quite practical. So enough about the case… on to the main attraction! Well first off, let me say this: The Oxnard F55e looks absolutely stunning. I’m no expert on nitro/sunburst finishes, but to me, the burst on this axe looks drop dead gorgeous. 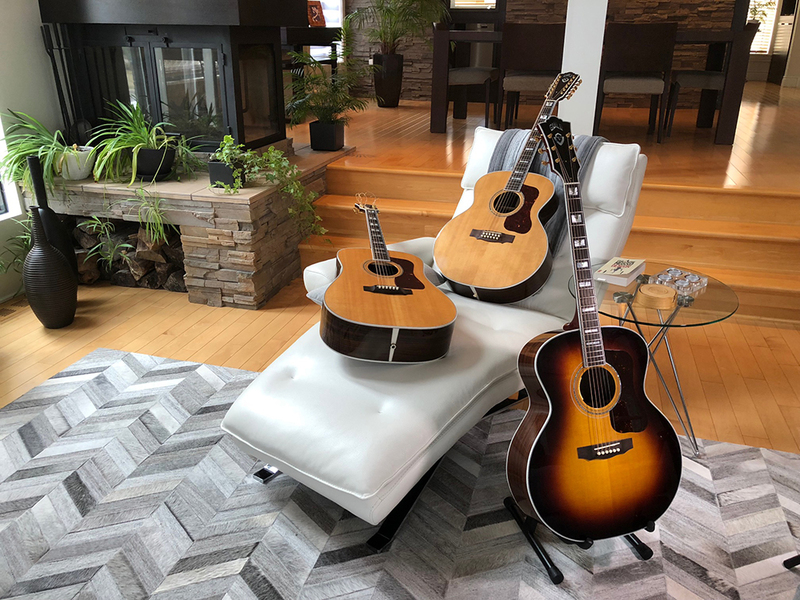 The guitar is sitting right next to my NH D55 and NH F512 and does not look out of place… quite the contrary. Upon closer inspection, the fit and finish is impeccable. Looking closely at the neck joint where it meets the body, I see no glue spillage and no checking. 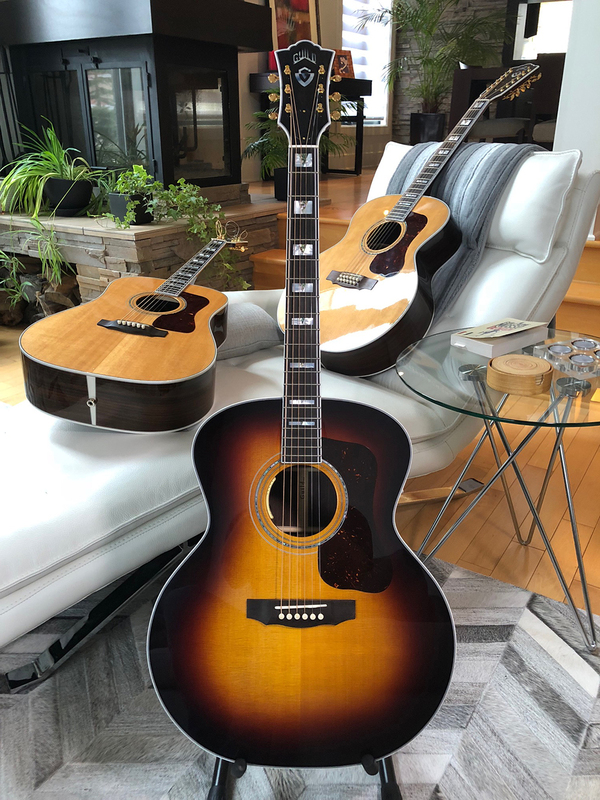 The binding, the fret work, the inlays, bridge, etc… everything looks top notch… Going back and forth between my New Hartford Guilds and this Oxnard, I see no difference in the level craftsmanship. So now I decide to check under the hood. 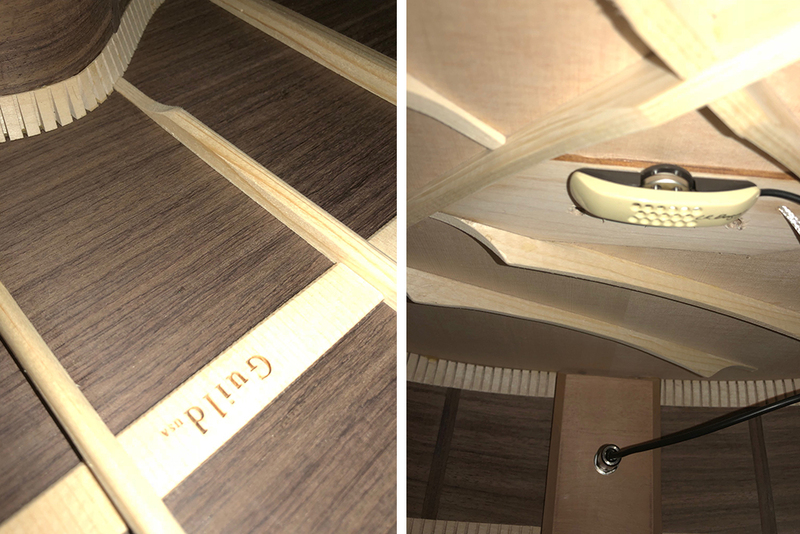 Sticking my phone into the soundhole, I take some snapshots of the bracing and the electronics. Again, everything looks excellent, no gobs of glue or spillage, everything nice and clean. 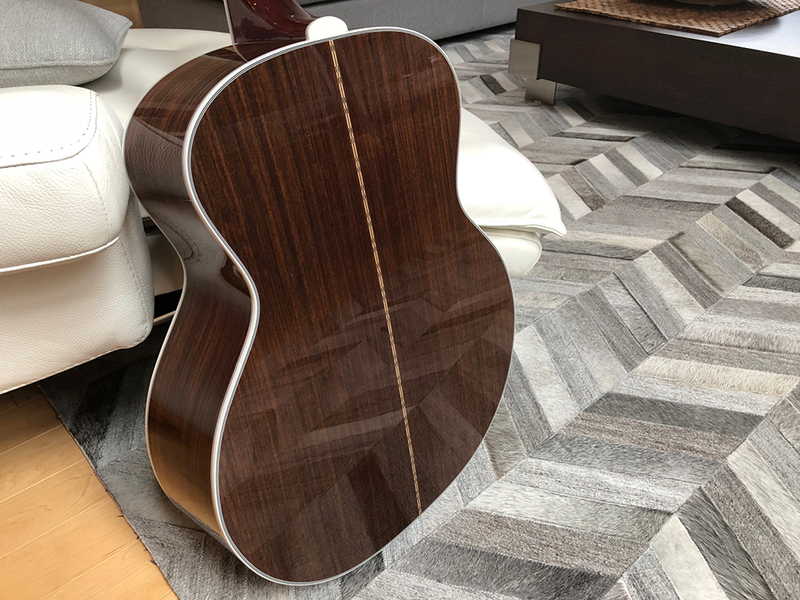 The grain on the solid East Indian rosewood back and sides is tight and straight. Next, I pick up the F55e and place it in my lap. The first striking difference between a typical vintage Guild and this one hits me: The weight. This guitar feels noticeably lighter even though it’s a big jumbo. I would say the weight and balance is akin to my SJ200. The next major difference I notice against my New Hartords is the neck. The C profile is noticeably shallower than on my D55 and the nut width is a true 1 11/16”, which is just a hair narrower than my dread. The frets are also slimmer, as is the binding. So it seems they shaved a bit off everywhere they could. Tuners are the same Gotoh open back gold Butterbeans as on my NH Guilds and turn nice and smooth. And with the lighter bracing comes lighter strings. The guitar comes stock with 12-53 strings rather than the mediums you would normally find on an F50R. The F55e also comes with an LR Baggs Anthem pickup vs the DTAR system you would commonly see on a NH Guild. 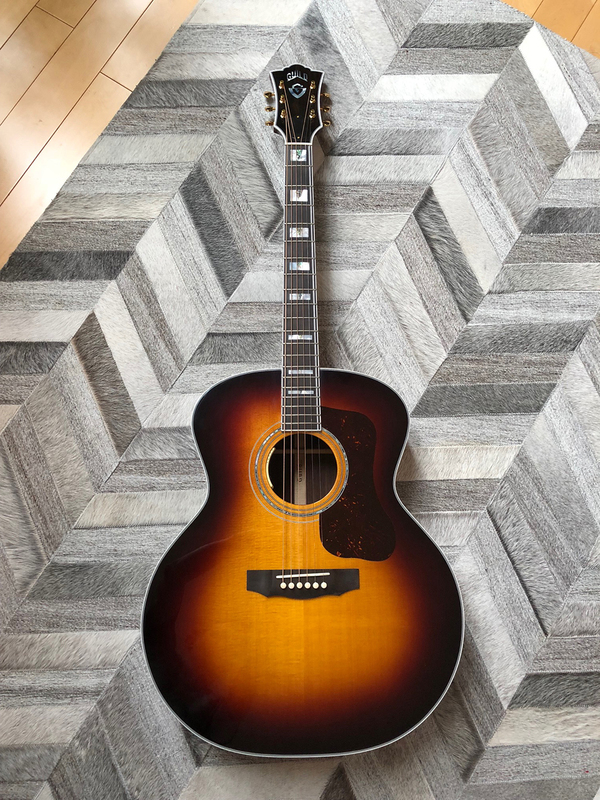 So let’s tune her up and give this baby a good strum…. This thing has got some serious low end and an awesomely deep rich warm tone. What a relief! I’ll admit I was a bit worried… reviews here have been mixed for the new D55 and people haven’t seemed too enthusiastic about adopting the new MIA Oxnard Guilds. But I can say without a doubt, this guitar sounds amazing… period. The bass response is impressive. I would describe it as thick, tight and focused… not boomy at all. The trebles are crisp and clean and the mids are well rounded, but not as full as on the D55. The lighter build and lighter strings also makes it more comfortable to hold and easier to play. I will admit, the F55’s tone and feel is very different than my NH D55. Some of that you would obviously expect when comparing a jumbo to a dread. However, you can tell that the new bracing and thinner top and sides has something to do with it. When playing both instruments back to back, I would say the F55 has a warmer, drier and woodier tone. Since I own a SJ200, I can’t help but hear some of Gibson’s DNA somewhere in there. I could imagine though that a diehard vintage Guild fan might be slightly put off by this F55e’s lighter build and more “modern” tone (for lack of a better term). For me personally, I really like it. YMMV! I gotta also say, after playing the guitar for a few days, I really like this neck profile. It has to be one of the most comfortable ones I’ve ever played. Mind you, it would have been a 10 on 10 if they had made the nut a little wider, say 1 23/32”, but it still doesn’t feel cramped, at least not to me. This guitar was made for strumming, but it also plays really well with flat picking and finger style. The drier tone and tighter focused bass give it better note separation than my D55 which has a looser bass response and sustains for days, which can sometimes get a little muddy on the low end. 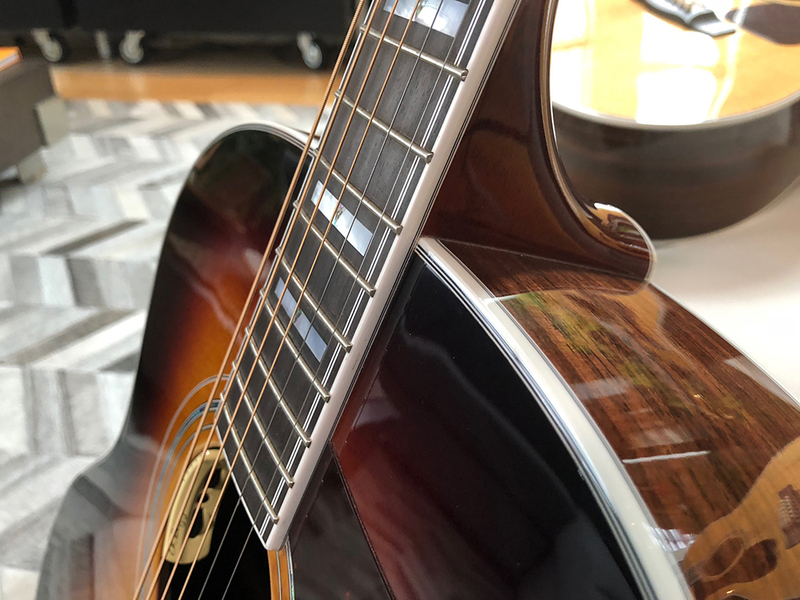 The LR Baggs Anthem pickup also sounds fantastic. My overall impression of this F55e is excellent. It meets and even surpasses my expectations. In my humble opinion, Cordoba have done a fine job and I think they have a winner on their hands. I think they managed to honor the Guild tradition all while incorporating a lighter and more modern feel to the instrument. It might not please the most diehard Guild vintage tone seekers, but I think Cordoba have made the conscious decision to look ahead and try to attract younger players and broaden their base. Which makes total sense for the brand’s perenniality. So technically, I have 14 days to try out this guitar. It took me about 14 seconds to decide that this one was a keeper. As luck would have it, a 2009 NH F50R popped up in my home town 2 days after I purchased the F55e (thanks again for the heads up TX). But quite honestly, I don’t see how it could be any better for me than this F55e. Its brand spankin new, comes with great electronics, an amazing case, fit and finish are impeccable, love the new neck profile and most important it sounds incredible and has a lifetime guarantee to boot. So, it’s a done deal for me. I’m officially the proud owner of a new Oxnard F55e burst. Last edited by ClydeTower; 04-17-2018 at 05:01 PM. 1). You got yourself a great, "for life" guitar. 2). The folks at Cordoba were smart enough to imbue their new, top-of-the-line instruments with the Ren Ferguson/Orpheum/New Hartford magical DNA. Congrats and thank you for the review. Your comments about bracing are intriguing. I hope that some LTG members who have the resources to do this will take it a step further and maybe provide sketches and measurements of Guild Jumbo bracing patterns over time. I think this was done by a member a while ago for older dreadnoughts and I found this to be a valuable resource. Yes that would indeed be interesting. Actually, if anyone that has a NH F50R would be so inclined to take pictures of the F50R's bracing, I'd be curious to see how it's evolved. Nice guitar and great write up. The living room... wow! Nice crib! Great review! Excited to read that Ox got this one as right as rain! Thanks man, That's just my take, others might have a different opinion. I would however be really curious to play both a F50R and a F55 back to back to hear the differences in tone. Both fine instruments for sure! That is an enviable trio of guitars, sir ! I wonder if those thickness specs more match the Orpheum specs ?